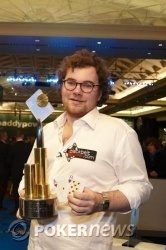 Congratulations then to James Mitchell who got got a fair slice of luck on the final table today, but managed to complete an exhilarating victory to take the trophy back home to England, following in the footsteps of Neil Channing back in 2008. Much consolation must go to Paul Carr though, who put up a brave performance today and was incredibly unlucky to not win today after playing some exceptionally aggressive poker heads up. Congratulations to all our other finalists including Rob Sherwood who manage to also take home an extra €100,000 for winning the PaddyPower Sole Survivor contest. This gave an enjoyable twist to the tournament and certainly increased the entertainment for those watching. We hope you've enjoyed the updates, but now it's time to stick a fork us, we're done! James Mitchell min-raised to 160,000 and Paul Carr called once more. The flop was and Carr checked, Mitchell bet 205,000 and Carr moved all-in. Mitchell thought for a few seconds and then called. Carr was caught in the cookie jar and needed a Queen to save his dream. The changed nothing and the river gave James Mitchell a full house and the title! James Mitchell raised to 240,000 preflop and Paul Carr made the call. Flop: . Mitchell continuation bet for 290,000 and Carr folded. James Mitchell raised to 160,000 and Paul Carr who doesn't fold in the big blind, make the call. The flop is and Carr check-calls a 205,000 bet. Both players check the turn and then Carr open-shoves the river. Fold from Mitchell. Paul Carr isn't going down without a fight, he pushed for about 700,000 and James Mitchell called. The board came and ace-high is good for a 1.4 million pot for Carr. Paul Carr made his standard raise from the button sending the decision back over to James Mitchell. Mitchell, as meticulous as always, reached for chips and made it 450,000. "All-in," announced Carr! Mitchell didn't insta-call, but he didn't reach for his cards either. Instead, he took a glance at his foe's stack and asked for a count. It was Mitchell with the shorter stack, out-chipped four to three million. "He looks like he's going to fold," declared Neil Channing in the commentary booth, but on this occasion, the 2008 Champion was wrong as Mitchell made a surprise call. As the hole cards were revealed, the crowd went bananas, Carr once again picking up a monster with . Mitchell could only muster . 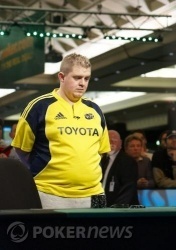 The was a terrible flop for the Brit, not even serving up a backdoor flush draw. The crowd looked ready to storm the stage. 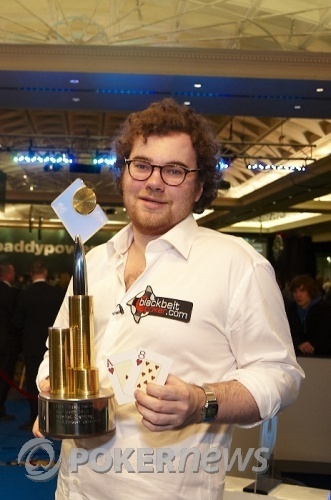 The turn was equally safe, and as the camera focused its attention on Carr, he blew out his cheeks, the realisation that he was just one card away from becoming the 2010 Irish Open finally settling in. "Ace from space!" commanded the small army of Mitchell fans. The roof flew off the Burlington Hotel as the Carr fans gasped and the Mitchellites erupted like Mount Vesuvius. Nobody could believe what had just happened - victory snatched from the very jaws of defeat.